Any idea what happens in 152 days? You can guess if you want. How about I phrase it a little easier: what happens in 5 months? You can calculate that on one hand. We are five months out from Christmas. With the way the weather has been, I am expecting 75 and partly sunny, considering we have had only three 90+ degree days so far in 2015. But I have to think of Christmas, cuz while it's only 85 out, you factor in the humidity and we are almost topping 100. Luckily, a few readers out there have looked at my want lists as I have knocked a few sets off the page in the last couple weeks. I left a comment on Adam's blog Addiction as Therapy helping with some needs. Adam dropped a bomb of a package on me. These 3 2007 Masterpieces were part of a stack that wiped out my entire needs. So the '07 and '08 Masterpieces sets are in the binder. I love those sets. Have a while to go with this year's GQ, but Adam included a few, with 4 of them being SPs. Also completed is the series 2 First Pitch. Melissa needs to be in a Sox uniform as she grew up here in my hometown. The donkey is one of two 2013 Heritage short prints. And Matt is one of the few 2015 flagship Adam dropped as well. Holliday went to the throwback binder. Appreciate the cardboard, Adam. 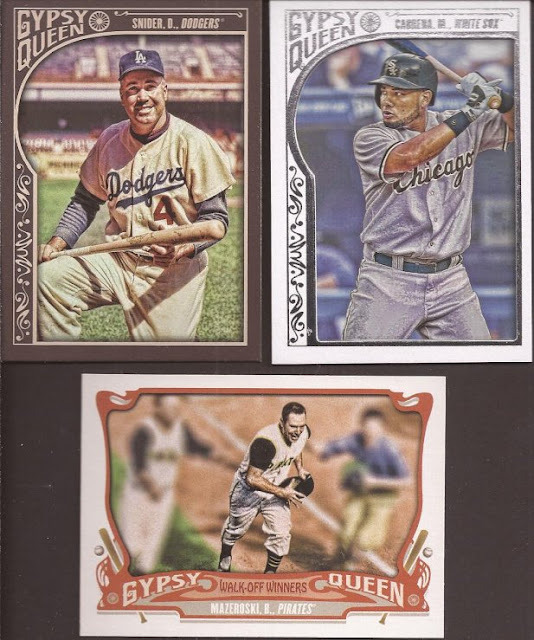 Jusdon over at the fun My Cardboard Habit got in on the set completing. 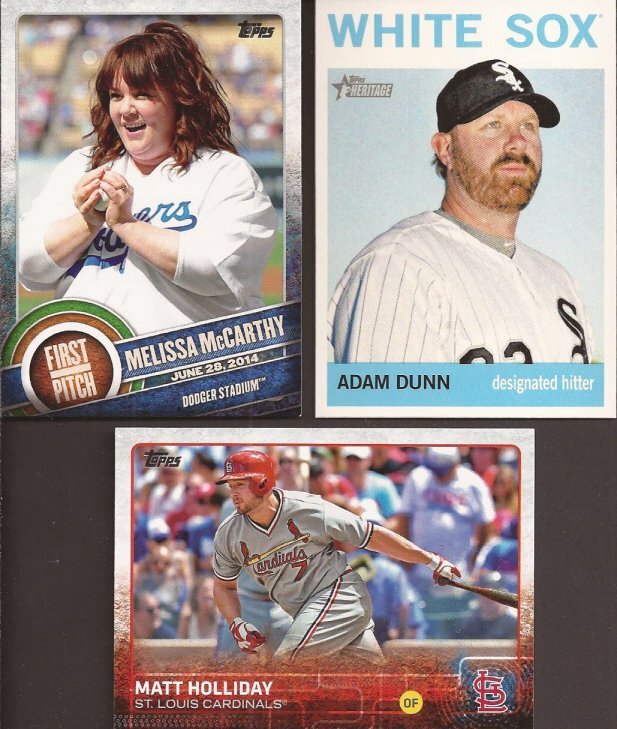 He sent over the same cards Adam did for the First Pitch. However, Mr. Hart is in a throwback, so all were not for naught. The best part was the group of series 2 cards that did complete that set. Off the page it went! Judson did not stop there. I was not feeling blue after seeing these two beauties (yeah - I had to go there, sorry). 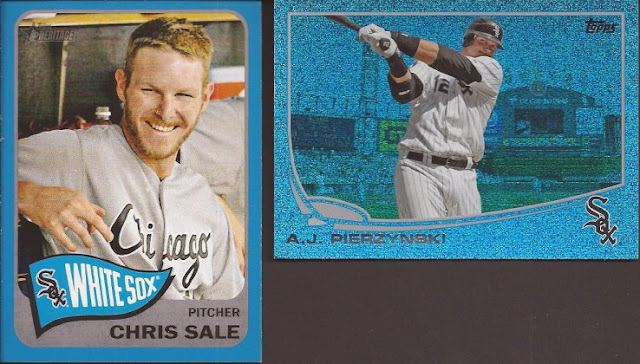 I have the 2013 Heritage blue of Sale, but not the 2014. I almost want to complete the rainbow of the '13 AJ. At least I am another card closer if I go that route. But this dozen started the trade. OH BABY!!!! Harder and harder to find recent cards that are miscut, but 2015 seems to be a big year. Of the cards in the binder over the past 10 years, 2015 blows away the previous 9 years combined. All 12 cards are horizontal. Judson could have stopped there, but he had to go one step beyond. 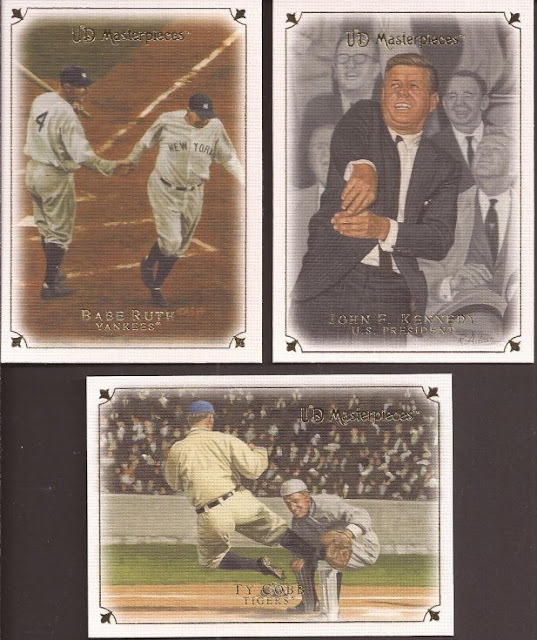 That would be the image variation from Paulie's card this year. 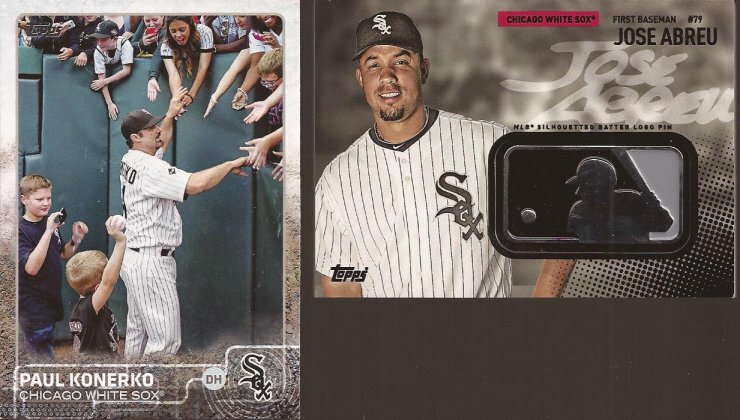 And I received the Future Star Abreu manu-relic in a case break over at Nacho Grande. Now I have the hitman logo pin. If I can get the First Home Run medallion, I have them all. Appreciate all the extras, JM. 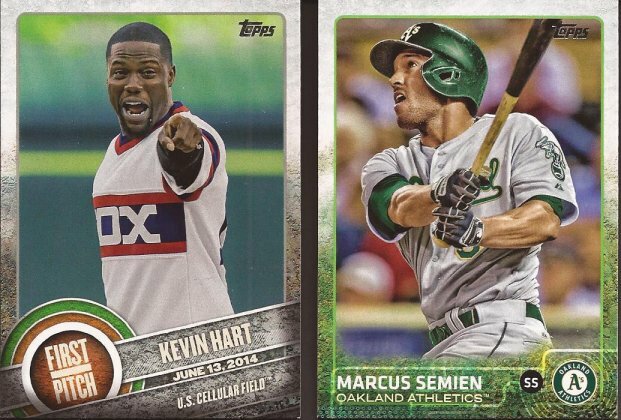 Not sure what I like more... the song or the Kevin Hart card. Great stuff.